This case study in PDF format can be downloaded here. This brief case study examines the use of OPERA, CESR’s monitoring framework, to analyze Ireland’s economic crisis and the Irish government’s subsequent austerity policies. It is part of a series of case studies produced by CESR to share insights and learning from the use of OPERA in a variety of contexts and settings. Published in 2012, Mauled by the Celtic Tiger was a research report that assessed the Irish government’s response to the global financial meltdown and the effects that response had on economic and social rights. The goal of this report was to encourage key policymakers—both in Ireland and internationally—to include human rights principles in their responses to the crisis. Further, we hoped to complement and augment the efforts of individuals and groups in Ireland who struggled to have human rights included in remedies to the economic collapse. 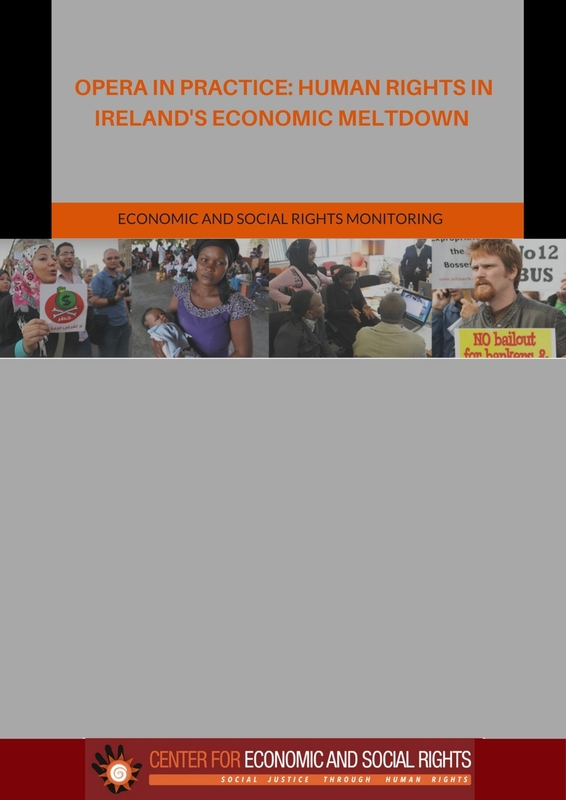 The report tells the story of Ireland’s economic meltdown chronologically: it first explores the contextual factors and policy failures which paved the way for the country’s economic demise; then addresses how the crisis was handled from a human rights perspective; and finally, it analyzes the impacts on specific rights. So while the structure of the report does not mirror the four steps of OPERA, the framework influenced the analysis in each section and the way that we highlighted the links between them. The report was compiled from an analysis of secondary data made available by governmental and non-governmental sources, with additional information provided through interviews.